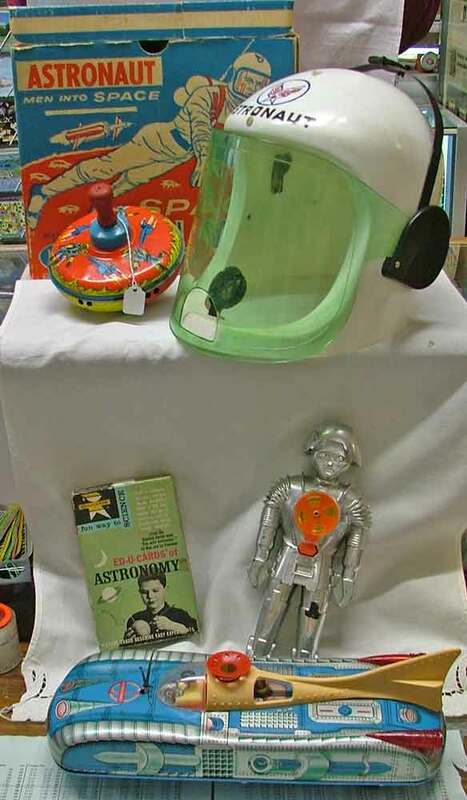 Check out these amazing toys from the 1950s and 1960s available for the aspiring astronaut or space scientist on your gift giving list: The photo below includes an Ideal Space Helmet, a spinnter spaceship top from the 1950s that even whistles, Twiki the Buck Rogers robot of the 1960s, Ed-U-Cards on Astronomy (1960s) and a great Space Car. 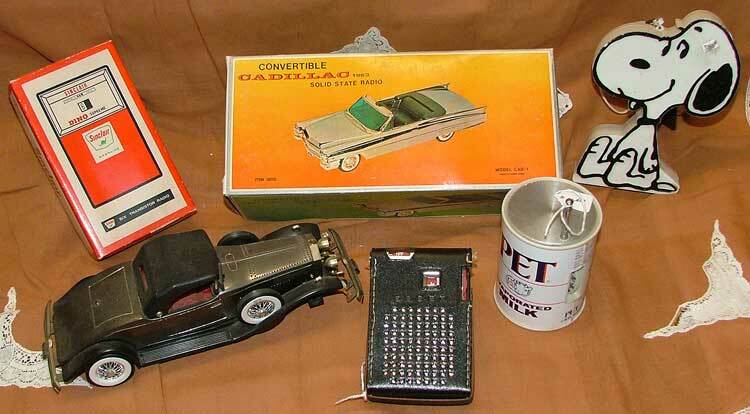 Here’s a close up of the battery-operated, Interkozmos space car, made in Japan, 1950s. Remember, only 10 days til Christmas, Hurry in and find that perfect gift for the special person on your list. We’re here to help. And we most definitely, will be watchin’ for ya! CRACKLE GLASS Adds Sparkle to the Holidays! 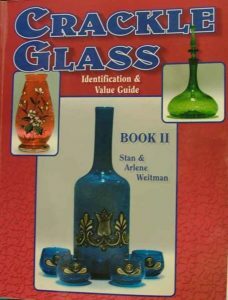 GLASS is the third most popular collectible in the world, preceded only by coins and stamps. We feel CRACKLE GLASS is the most beautiful. Have you ever seen CRACKLE GLASS in a window when the sun reflects off the glass? A window decorated with different colored crackle is truly breathtaking. 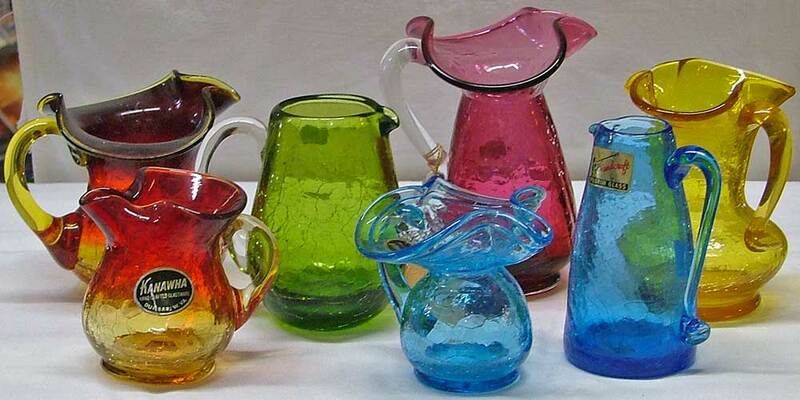 Crackle Glass is known by other names, such as CRAQUELLE GLASS, ICE GLASS, OVERSHOT GLASS. 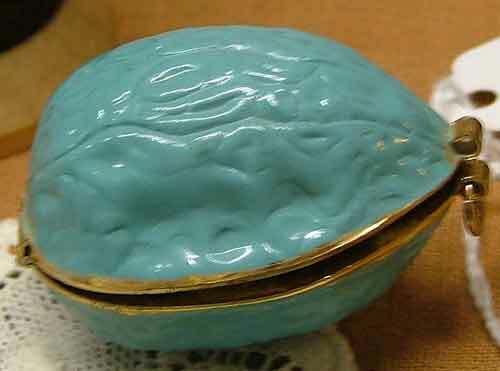 It was the Venetian Glass Makers of the 16th Century, who invented this marvelous process. The glass was immersed in cold water while it was molten hot, thereby cracking the glass. 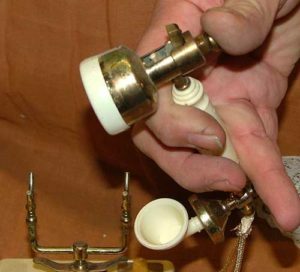 The glass was then reheated and either mold or hand blown into the shape the glass blower desired. The reheating of the glass sealed the cracks. If you run your hands over CRACKLE GLASS, you can feel the cracks, but the inside is smooth to touch. 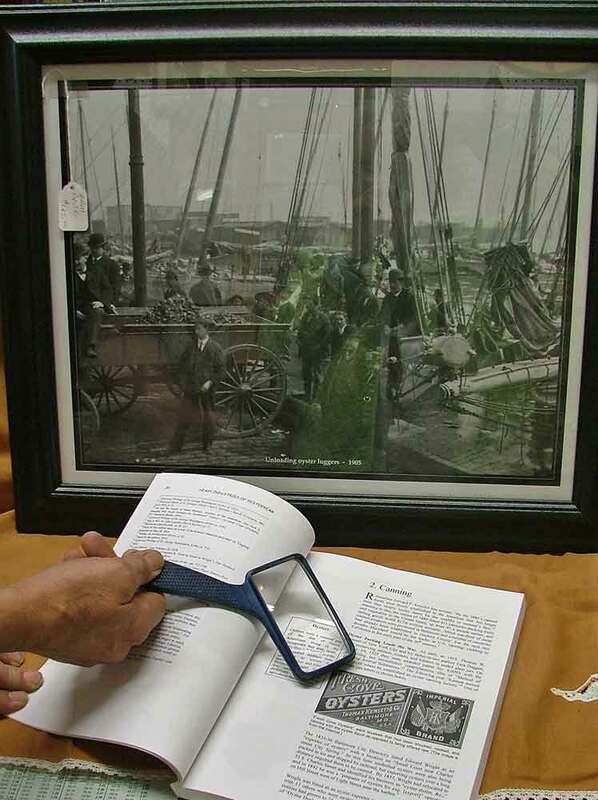 Some of the companies that produced CRACKLE GLASS are: Blenko Glass Company, Pilgrim Glass Company, Mt. Washington Glass Company, H.C. Fry Glass Company, Boston & Sandwich Glass Company, Hobbs, Bruckunier & Company, Cambridge Glass Company, Kanawha Glass Company. 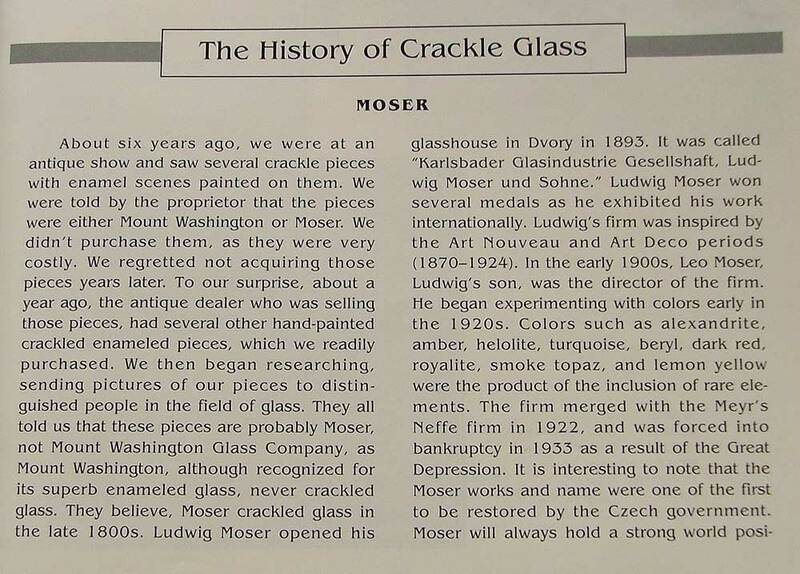 Some of these companies are still operating today, making CRACKLE GLASS. Pieces included in the above photo are Kanawha of Dunbar WV, Pilgrim Glass, in beautiful colors of amberina, green, amethyst, blue and amber. The beautiful little vases and pitchers are stunning on a window sill where they’ll beautifully reflect the the light. 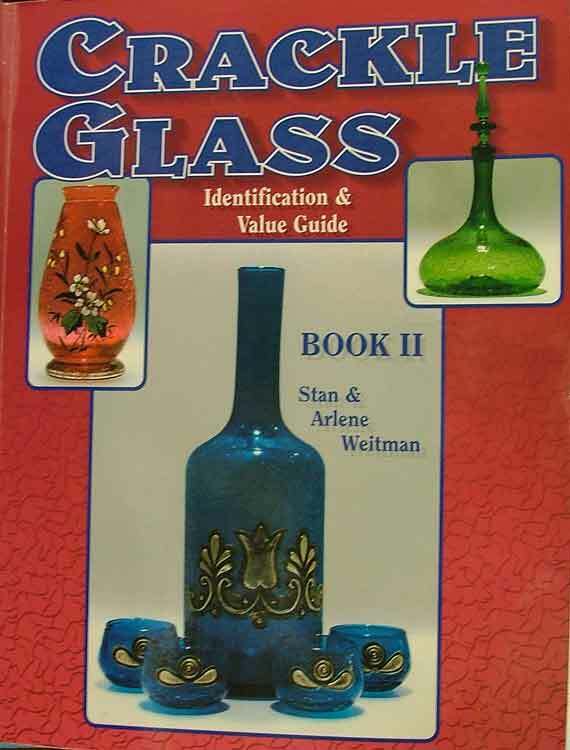 The above excerpt is taken from the book: Crackle Glass, Volume 2 by Stan and Arlene Weitman. Well, you know the story… we have 44 Gift Giving Ideas PLUS! So stop by soon…. Christmas isn’t far off. We’re ready to help. And yes… we’ll be watchin’ for ya! But a knife is a tool first and foremost. A pocket knife quite often will have more than one blade that will allow you to loosen/tighten a screw, or even open an envelope. 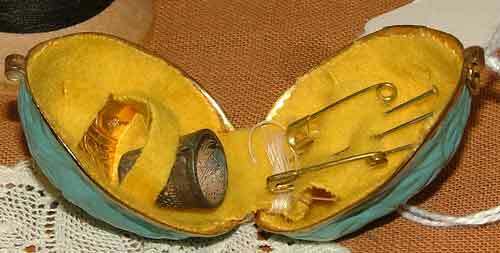 Others can be used to whittle wood to create a toy or small sculpture, open a package, remove a splinter, and still others are used by hunters. 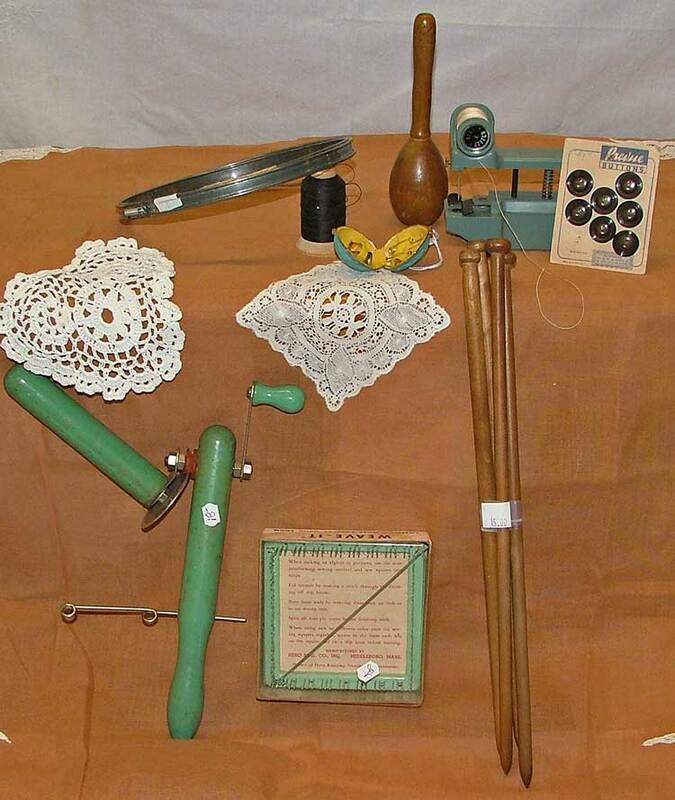 The photo below shows the following: at top is a Display Knife made for Jones & Company by Maxam. 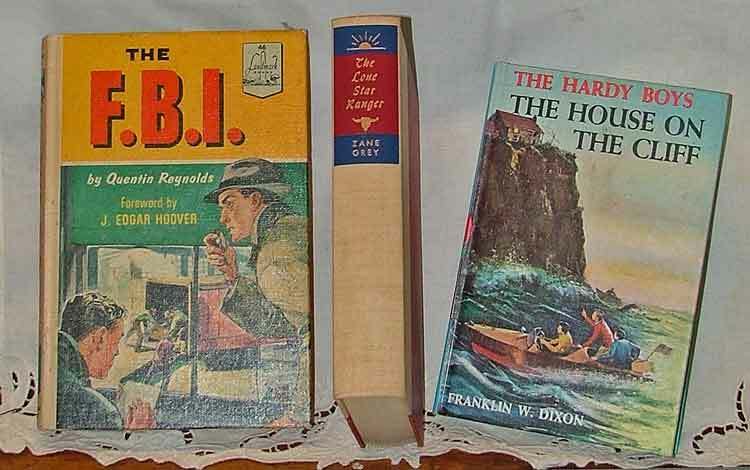 Below that are l. to r.: 1970s Buck Knife #317 with a black case – no longer made, a 1950s Boy Scout Knife “Be Prepared”, a pen knife by Imperial with 2″ blade and a Florida Souvenir Knife in sheath and it has a small compass on the handle. 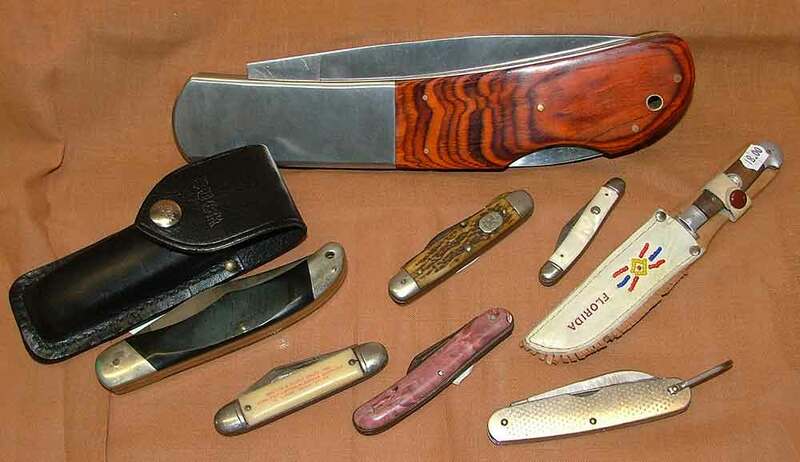 The bottom row is an advertising pocket knife with 3″ blade for P.K. Maurer & Scott Sales Inc. – says High Explosives Blasting Supplies and also IV. 3.0300 Phila. 27, PA, also a Johnston Mfg pearlized handled 2″ blade pocket knife, and a U.S. Military knife by Camillus 1977. … because YOUR SAFETY matters to everyone at Bahoukas. We’ve attached this short video to help guide you in using your knife. All kids should learn from someone with experience. Think safety first! ENJOY! Okay… stop in soon with your gift list, we’ll be watchin for ya and ready to help! 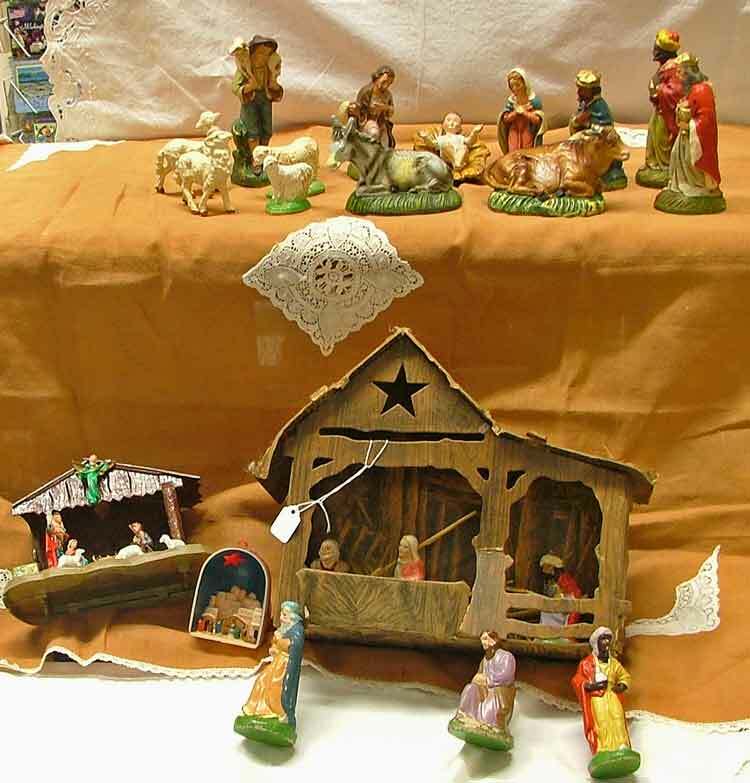 We have a few very collectible Nativity Scenes that include a 1950s Italian Set made up of 12 pieces, a Plastic Nativity from the 60s, an ornament light that can fit over a bulb on a tree from the 60s, a U.S. 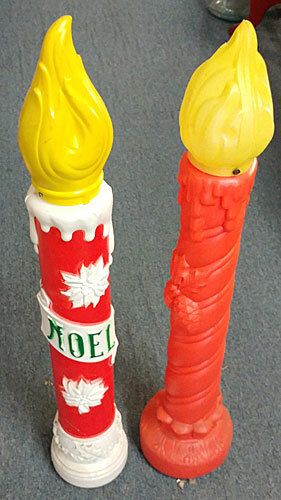 Zone – Germany set from the 40s in fair condition considering it’s made with Papier-mâché figures. 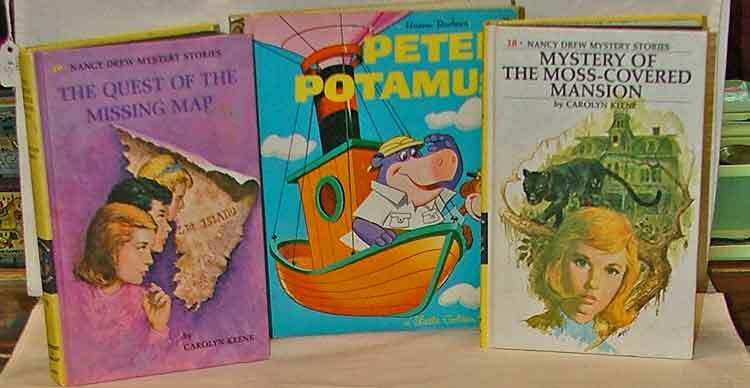 One of these just might make someone on your gift list very happy! Papier-mâché is a composite material consisting of paper pieces or pulp, sometimes reinforced with textiles, bound with an adhesive, such as glue, starch, or wallpaper paste. 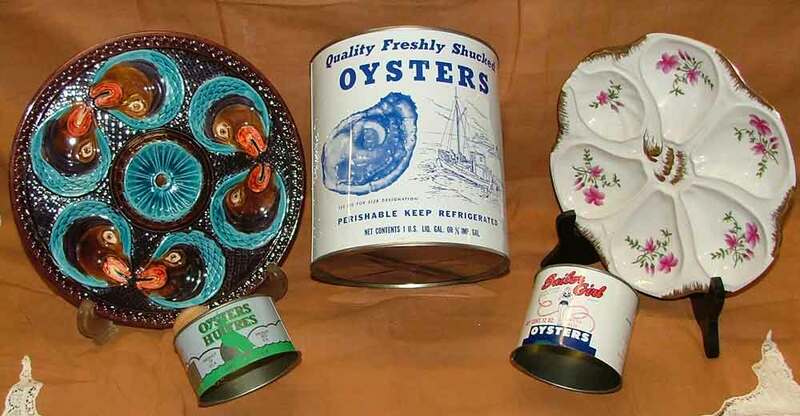 You already know that here at Bahoukas Antique Mall we have some mighty fine ideas to help you with your gift giving. Let us know what you’re thinking about and we’ll do our darndest to help you find it. Hurry in… we’ll be watchin’ for ya! Everyone Needs A Santa or Two! 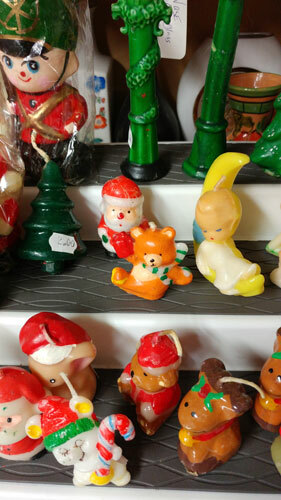 We have a delightful array of Santas available from silly and funny to a bank or a candle. 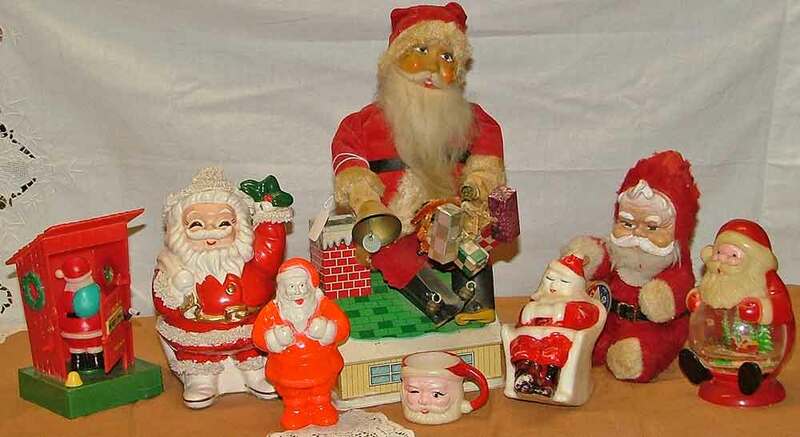 The photo below includes a 1960s Santa-in-the-Outhouse, a Spaghetti Santa ceramic bank, a 1960s battery-operated animated Santa on a roof top, a stuffed Santa from the 1950s, in front is a plastic Irwin Santa, a small Santa mug, a rocking-chair Santa candle and a Santa Snow Globe (all from the 60s). 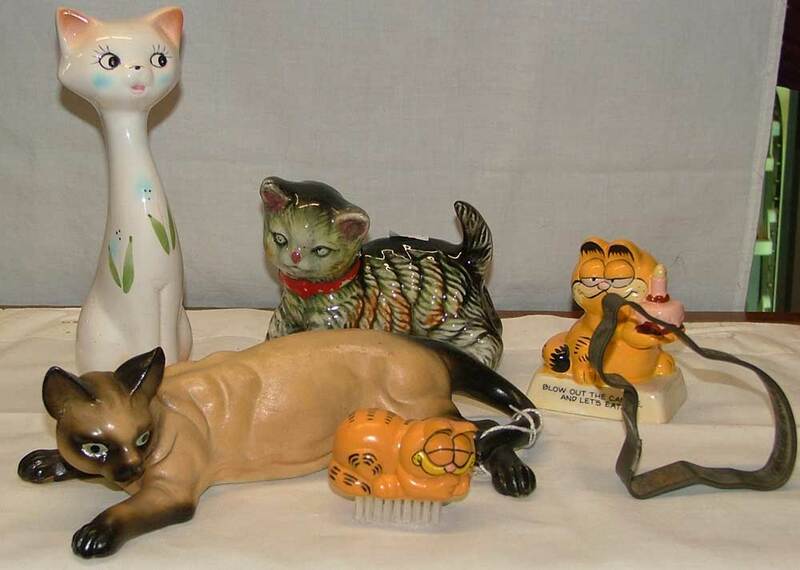 CLICK HERE for a great blog post that tells you how best to clean a spaghetti ceramic figure. It can really change an old piece to a real collectible. Vintage spaghetti poodle dogs have so much charm and character. 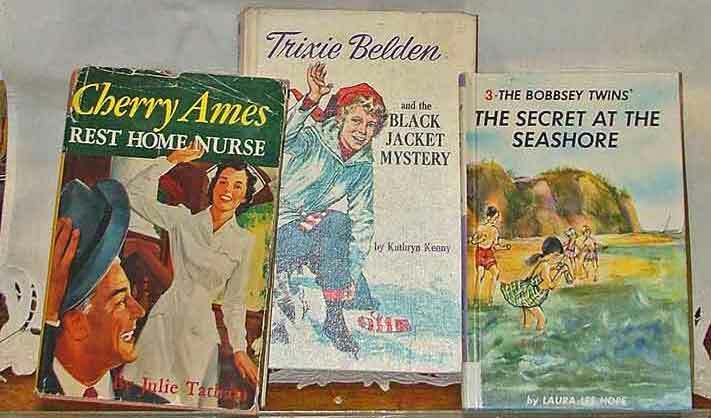 They come in a variety of colors and styles and can be found highly decorated with rhinestones, bows, glasses, hats, playing sports, chain leash with puppies, depicted as fireman, graduating students, band musicians, reading the daily newspaper, snooty, high fashion, smoking, brides and more! 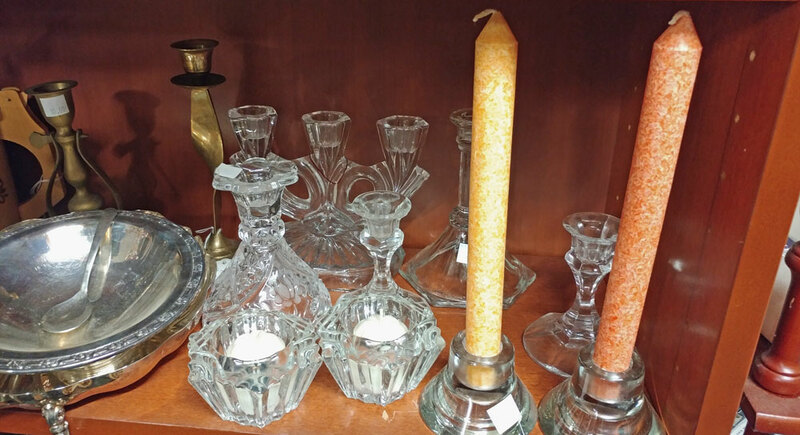 Whether you need a fun stocking stuffer, a new piece to add to your holiday decor, or just a cute little Santa for a bit of ho-ho-ho, stop by Bahoukas Antique Mall in Havre de Grace and see what we have to add to your holiday decorations and celebrations. Some of these pieces could also be added to a wreath for a special touch. So, as you know, we’ll be watchin’ for ya! HERCULES is also celebrating an anniversary! The Disney film from 1997 celebrates 20 years in 2017 – WOW! My how time flies when we’re having so much fun. 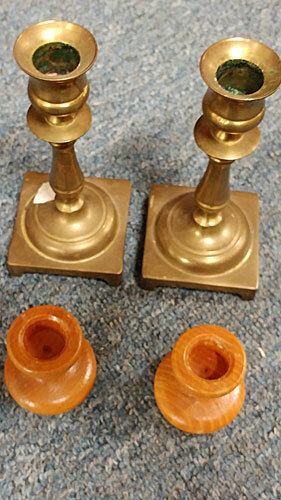 Here’s a photo of a few of the HERCULES items we have in the shop. 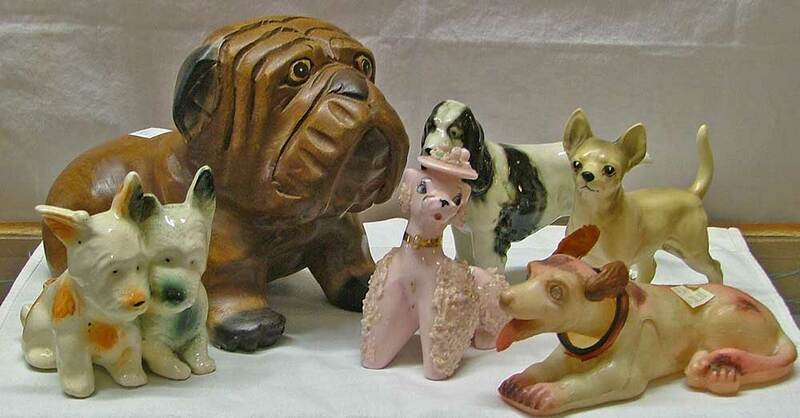 These are 5″ figures 1996 by ToyBiz Inc for Disney. They include Mole-Man, She-Demon, Mesomorph, Xena and Centaur. 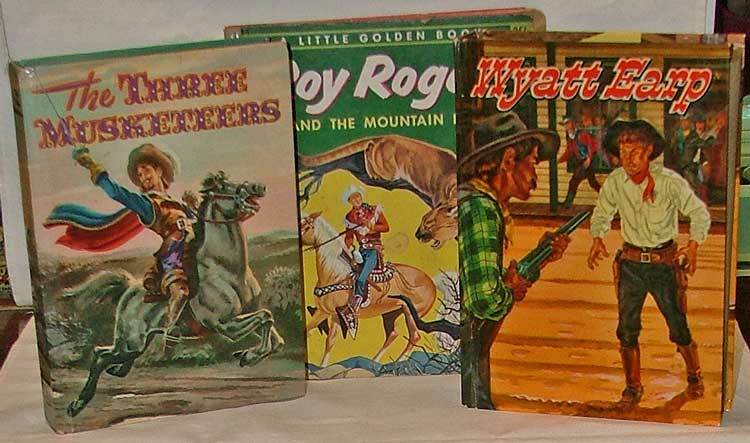 Great stocking stuffers for the young ones or for the ‘big kid’ who still collects them! 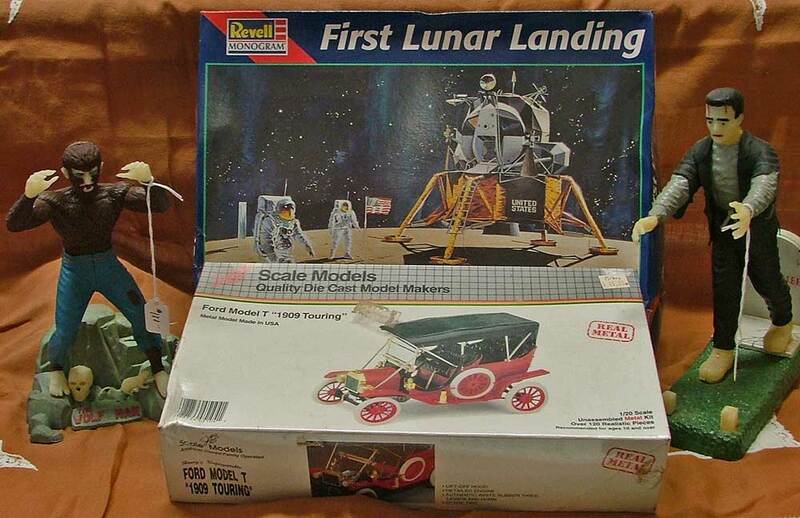 We also carry X-Men, Star Wars, Star Trek, GI Joe, and other action figures. Hurry in to choose the figure you – or someone special you know – would like to have! Below is the trailer for the original HERCULES movie from Walt Disney Pictures! ENJOY! 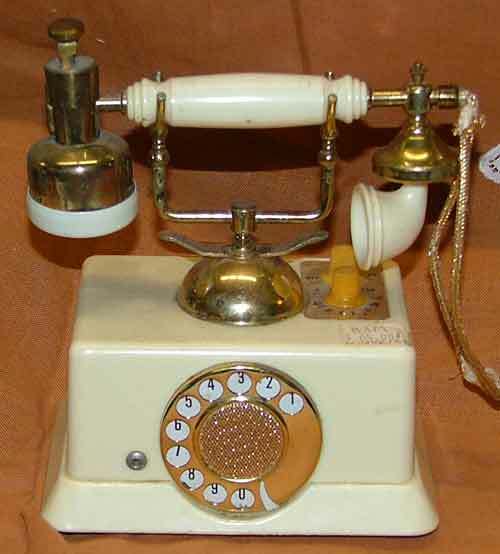 Then hurry in to Bahoukas Antique Mall in Havre de Grace, MD. We’ll be watchin’ for ya!